This design is derived from the Portable Headphone Amplifier featuring an NPN/PNP compound pair emitter follower output stage. An improved output driving capability is gained by making this a push-pull Class-A arrangement. Output power can reach 427mW RMS into a 32 Ohm load at a fixed standing current of 100mA. The single voltage gain stage allows the easy implementation of a shunt-feedback circuitry giving excellent frequency stability. The above mentioned shunt-feedback configuration also allows the easy addition of frequency dependent networks in order to obtain an useful, unobtrusive, switchable Tilt control (optional). Q4, Q5 and IC1 must be fitted with a small U-shaped heatsink. For a Stereo version of this circuit, all parts must be doubled except P1, IC1, R14, D1, D2, D3, C8, T1, SW1, SW2, J2 and PL1. If the Tilt Control is not needed, omit SW1, all resistors from R15 onwards and all capacitors from C9 onwards. Connect the rightmost terminal of R1 to the Base of Q1. Before setting quiescent current rotate the volume control P1 to the minimum, Trimmer R6 to zero resistance and Trimmer R3 to about the middle of its travel. Connect a suitable headphone set or, better, a 33 Ohm 1/2W resistor to the amplifier output. Connect a Multimeter, set to measure about 10Vdc fsd, across the positive end of C5 and the negative ground. Switch on the supply and rotate R3 in order to read about 7.7-7.8V on the Multimeter display. Switch off the supply, disconnect the Multimeter and reconnect it, set to measure at least 200mA fsd, in series to the positive supply of the amplifier. Switch on the supply and rotate R6 slowly until a reading of about 100mA is displayed. Check again the voltage at the positive end of C5 and readjust R3 if necessary. 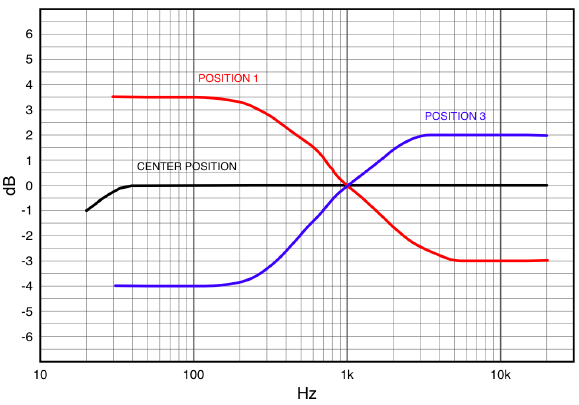 Those lucky enough to reach an oscilloscope and a 1KHz sine wave generator, can drive the amplifier to the maximum output power and adjust R3 in order to obtain a symmetrical clipping of the sine wave displayed.